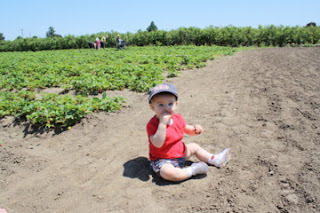 Oregon seems to be the perfect climate fro growing strawberries and as soon as we flip the calendar page to June, every country road has a 'You Pick Strawberries' sign every 5 miles. My mom makes an amazing strawberry pie, but we're planning on makes a couple batches of strawberry jam for family and friends as part of their Christmas present. If the stars align and I'm able to film it, I'll make a vlog about canning your own jam. I've been excited to take MY daughter strawberry picking and today was the day. Since it's the 4th of July weekend, I dressed her in a patriotic outfit with her (clearance bin) Gymboree strawberry socks that I was so excited to find. I brought my giant white tupperware bowl (with hot pink lid - eee!!) as a nod to my childhood and away we went. 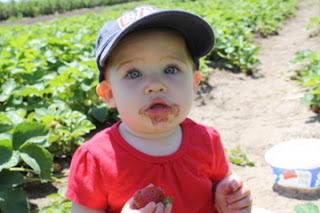 Hannah started eating the berries before I had even picked a handful, but when it was all said and done, I think she ate more dirt than actual produce. If I did it again I would have gone earlier in the morning before it got quite so warm and I would have brought a wet and slightly soapy washcloth in a ziplock bag. We cleaned her up with wet wipes, but there was a lot of dirt and strawberry stains on her legs and fingers. I'm glad we had already planned to go directly home for bath and nap time as she desperately needed both after all the excitement. That's where we found this farm. Visitors leave feed back and comments so you know what to expect. what a sweet day...and a sweet lil' girl! i loved the video and her outfit is so cute! I love that picture of her strawberry covered face. So cute! Such a cute video. Glad y'all had a sun shine day. Aw... this makes me want to go pick berries. Love that you don't mind letting her get dirty! Hope you guys have a great 4th.